This has been the strangest election time ever, with weird and unqualified people vying for top government positions. Perhaps there should be a test to see who is mentally stable and intellectually astute enough to hold a political office. We need a license to be a hairdresser, therapist, or an accountant. Isn't a governor, congressman or senator just as significant? Many will be elated and thrilled at the results, while others will be very bummed out, even devastated. Either way, this election has the potential to change millions of lives, and we are all going to have to live with the outcome. It is our ability to be fully present and engaged that enables us to accept every situation exactly as it is, without preconceptions or judgments; to embrace difficulties, deep sadness, upset feelings, or injustice while staying aware, present, and available. In our book "Be the Change" (see below), psychotherapist Maura Sills told us, "A monk who used to come to the institute was asked how we can measure spiritual progress, and he said it was by our capacity to be effective, which he saw as listening and being present." She added, "When the capacity to be effective is diminished or lost, then I think we have lost our humanity." We can bring that sense of presence into our daily lives. As Jon Stewart said at the Rally to Restore Sanity, "All I want is your presence." It may not be possible to maintain it all the time; there are endless external distractions, let alone the demands of the ego-mind and ongoing internal chatter. But we don't have to let such distractions rule. Accepting and being with what is doesn't mean we are powerless or become a victim. In fact, it is quite the opposite; it makes us even more powerful. We cannot change anything until we totally accept it as it is, for in that moment of acceptance we can move to transform it. If we do not accept what is, then we will keep resisting or denying, making transformation impossible. For example, if pouring rain is thwarting our plans, then we can either get upset and moan and groan, or we can accept that it is raining and see what else we can do instead. Everything we think, say, and do has an immediate effect on everyone and everything else. This means that our thoughts and actions can lead to chaos and destruction as easily as they can lead to creativity and transformation. It also means that we have enormous resources available to us at all times. "Do not make the mistake of thinking you are a powerless individual in a vast world," writes Tai Situ Rinpoche in our book "The Way Ahead." "Know that you are armed with three great powers. You have the power of the body -- the source of all action; the power of speech -- the source of all expression; and the power of the mind -- the source of all thought." Our actions, obviously, have the most direct impact on others. The destructive results of the belief that we are disconnected and that, therefore, what we do has no bearing on others is apparent everywhere. While Deb and I were in southern Egypt, we hiked far up a dry riverbed into silence and beauty and rubbish: piles of polystyrene and plastic dumped in the middle of nowhere. While in Sri Lanka, Deb was happily swimming in the beautiful Unawatuna Bay when human feces floated past her. We have all just experienced such selfish and mindless behavior with the oil spill in the Gulf, which wrecked untold damage due to this same belief that it does not matter how our actions affect others. We misuse the world when we believe that we are independent from it or in some way superior. Every action we take, even the smallest and simplest of everyday choices, has a consequence, no action is independent of its effects. Nothing is without a purpose. And yet we think we are separate from this. The impact of our words is less obvious than that of our actions, but they are just as effective. Words are heard and felt; they reverberate throughout our system, affecting those who hear them and causing either joy or conflict. They can start wars or mend hearts. As such, they should not be used lightly but with consideration of their influence. Thoughts may be subtler, but when used purposefully, they are equally powerful. From our thoughts are born our words and our actions; they influence our behavior and beliefs, whom we care for and whom we dismiss. They also influence the unseen and unknown as we send our thought waves and energy out into the universe. Positive thoughts and feelings bestow all the riches life can offer, while negative ones deplete our whole being. Which will you chose? How can you use your actions, words, or thoughts help others? Do comment below. You can receive notice of our blogs every Tuesday by checking "Become a Fan" at the top of this page. 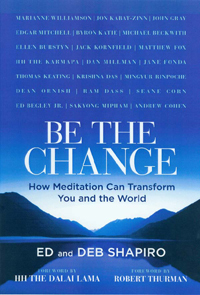 See our award-winning book, "Be the Change: How Meditation Can Transform You and the World," with forewords by the Dalai Lama and Robert Thurman and contributions from Jack Kornfield, Gangaji, Jane Fonda, Ram Dass, Byron Katie, Jon Kabat-Zinn and others. Our three meditation CDs -- "Metta: Loving-Kindness and Forgiveness," "Samadhi: Breath Awareness and Insight" and "Yoga Nidra: Inner Conscious Relaxation" -- are available at www.EdandDebShapiro.com.